Coffeehouses played a big role in the folk music revival of the 1950s and 1960s. Don Firth, whose interest in folk music began in the 1950s in Seattle, recently wrote in the June/July NW HOOT about “Seattle Coffeehouses during the 'Folk Revival' of the 1960s." One of the first folk music coffeehouses in Seattle, opened in the summer of 1958, was the Café Encore on upper University Way. Singers were allowed to play for tips. In the spring of 1959 Bob Clark opened The Place Next Door, so named because it was next door to the Guild 45th theater on N 45th St. in Wallingford. He paid singers to sing on Thursday, Friday and Saturday nights. Some of Seattle’s best folk singers regularly performed there. In 1962 Bob Clark sold The Place Next Door to Seattle folk singer Stan James. Stan’s interest in Australia led him to rename it The Corroboree after a ceremonial meeting of Australian Aborigines. Stan had regular singers on Friday and Saturday evenings, and an open mike on Sunday evenings. Many Seattle folk singers including Alice Stuart, Steve Lalor, Paul Gillingham and Nancy Quensé got their start there. When we revived the 56-year-old Pacific Northwest Folklore Society two years ago we wanted to create an updated version of the old folk music coffeehouse. Our first attempt was at the Kaffe Shachor near Greenlake. We had two monthly concerts there, but after they double booked us with a punk rock band we moved to the Library Café on Crown Hill. That lasted about four months until the Café folded and we moved to the Wayward Coffeehouse in Greenwood. We have been at the Wayward since last October (2008), and it has proved to be one of our nicest venues. The music area, in back of the coffee bar, is a funky area with different-sized tables and chairs scattered about. It can seat about 45-50 people, with standing room around the coffee bar for another dozen or two. The first concert at the Wayward was an all-blues evening with Mick Knight and Orville Murphy. In January Alice Stuart packed the house (standing room only) for a great concert. Alice got her start singing in Stan James' coffehhouse, the Corroboree, in the early 1960s. Here, almost fifty years later she's again singing in a Seattle folk music coffeehouse. And more recently, on May 8, 2008, we produced the Canote Brothers in another standing-room only concert. More videos of these coffeehouse concerts can be seen on the NW HOOT-Videos. 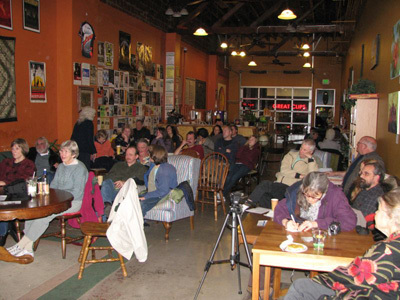 The aim of the coffeehouse concert series at the Wayward (8570 Greenwood Ave N) is to showcase the more traditional folk music of the Pacific Northwest with local musicians. These concerts are scheduled every 2nd Friday of the month from 8-10 pm. Traditional folk musicians in the Seattle area are encouraged to contact PNWFS for a possible gig. Stewart Hendrickson is Chemistry Professor Emeritus – St. Olaf College, Research Professor Emeritus – University of Washington, and in his new career, an unemployed folk musician (voice, fiddle, guitar; stewarthendrickson.com). Email him for questions, ideas or comments.